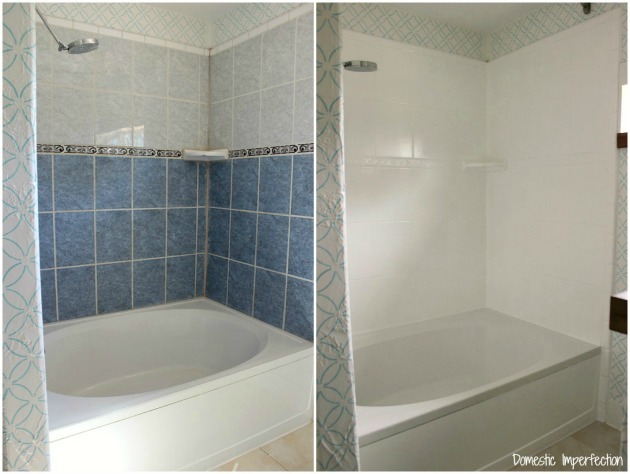 Last October I did something crazy….I painted my shower. The post I wrote about the process has become one of my most popular, probably because (much like my paper bag flooring) it’s just an unusual concept. Anyway, since it’s been over a year I figured its high time for an update. After all, whats the point of posting crazy tutorials if I’m not going to let you know if they are a total waste of time or not? I have good news…it wasn’t a total waste of time. and here it is as of this morning. Overall, it looks great and I am really happy with it. I only painted the walls and not the tub (this is the product I used), but you can absolutely paint the tub as well (and I still might). My family isn’t easy on this shower, it is the only one in the house that we use and we use it multiple times a day. As far as cleaning it, we haven’t done anything special. Adam is actually the shower scrubber in our house, he uses cleaner and one of those handheld bristle brushes (the same one he uses to clean our car tires) to scrub it. (Well, not the same brush, but the same kind of brush. Gross y’all.) I’m not saying I recommend this method, I’m just saying that’s what we do around here and it hasn’t backfired as of yet. That being said, I DID have had to do a little damage control about six months ago. When I first did this project my husband wanted to fix some of the broken and cracked grout before we painted. He fixed it all up, and also gave the cracked grout between the tub and the tiles a fresh layer. The problem is that you should never put grout where the tub and the tiles meet, you always caulk instead. The reason being is the tub moves ever so slightly (like when you fill it with water) and this will cause grout to crack, where caulk is flexible. The builders of our house had put grout there and it had cracked, so Adam fixed it without really thinking that the grout shouldn’t be there in the first place. ANYWAY, the grout cracked again, which caused some water to get in under the paint in that area and flake off. It looks really terrible in that above picture, but when you step back you can see that it’s not that bad (especially considering I left it like this for MONTHS before fixing it). To fix it I simply taped around the corner, caulked (with caulk made specifically for showers), and smoothed out with a baby wipe before removing the tape. It was an easy fix and that area has had zero issues since. Update – we sold this house in August of 2016 (three years after painting the shower), and the paint still looked brand new, no chips or cracks. It may have been slightly less shiny, but not much. Overall I’m really impressed with the whole process and would do it again. I think it’s a great (and cheap!) way to cover up outdated tile that is driving you crazy. However, I still wouldn’t consider this a permanent solution. It is holding up well, but at some point it HAS to start looking bad and flaking, right? Even if it’s five to ten years down the road, it seems inevitable. I would say this is the perfect solution if you are planning to remodel (aka replace tile) at some point in the future but want the ugly outdated tiles gone ASAP. Has anyone else painted their tiles or tub? I know some of you said you were going to try it after my ORIGINAL TUTORIAL, I would love to hear how it is holding up! Update – I just saw that Rustoleum now makes a touch-up kit for this product! Now if I do get some chipping I can easily fix it without buying and mixing up a quart of paint. This still looks as fantastic as it did a year ago! 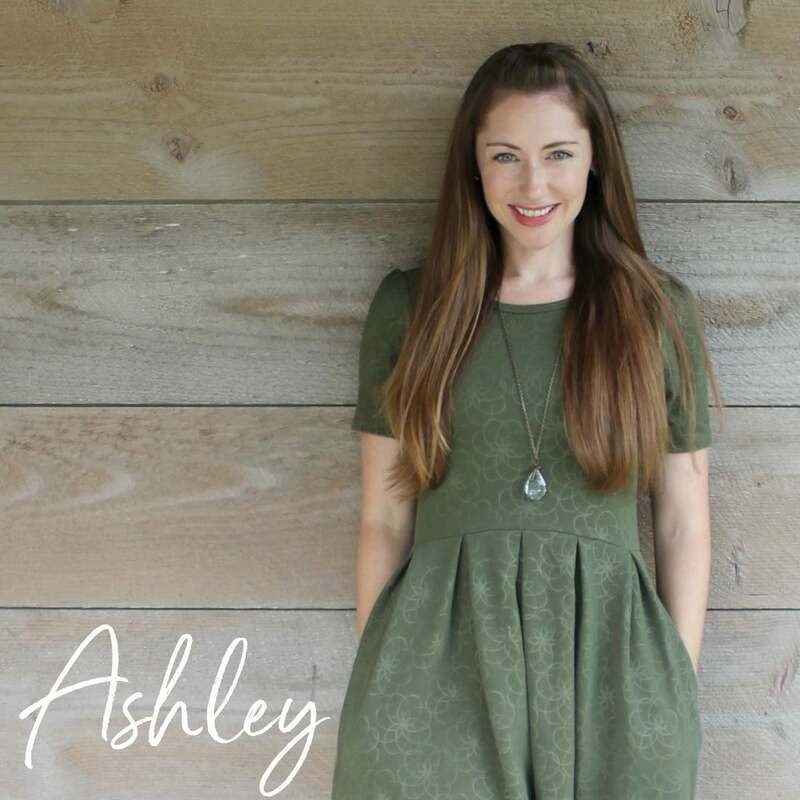 Great job Ashley! I am thinking about doing this in my apartment (with permission of course) Since the tubs are already white but have been used for some many years and I am glad to see it doesn’t fail! Fantastic as usual :) I adore you. This seems like a doable fix before the remodel in about a year or two. 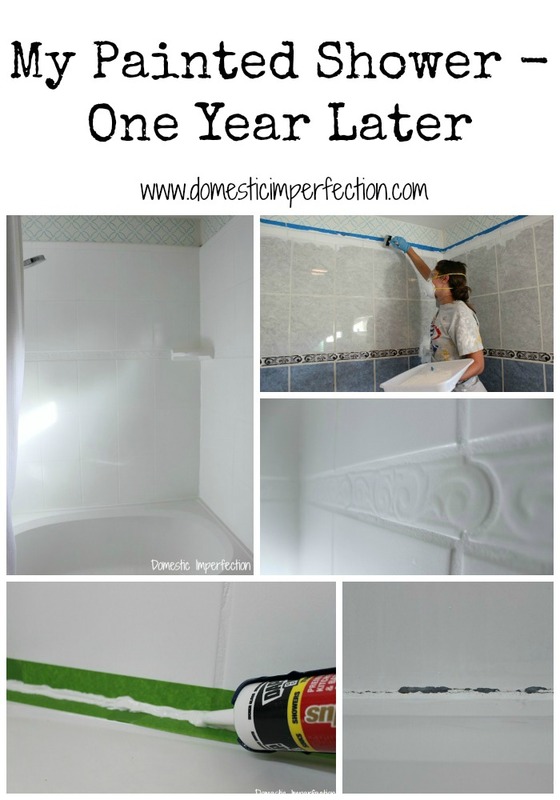 I actually did use this tutorial to refinish the tile in my bathroom over the summer. And I am LOVING the bright white tile instead of the yellowy 1960’s stuff! So glad I found your original post! In our last house, the master bath had a black faux marble vanity and … get this … a SALMON-colored toilet! We replaced the toilet, but I painted the vanity and it looked fantastic! It remained in perfect condition until we moved several years later. Also, it turns out that my grandmother had painted tile in her bathroom. My entire life I thought the tile in that bathroom was ivory. But when I was somewhere in my 40’s, the ivory began to chip ever so slightly and I realized that the tile was originally burgundy! If I had ugly tile, I’d paint it in a heartbeat! Glad to hear that it’s holding up over time, as I used the same product over the summer to paint my tub. 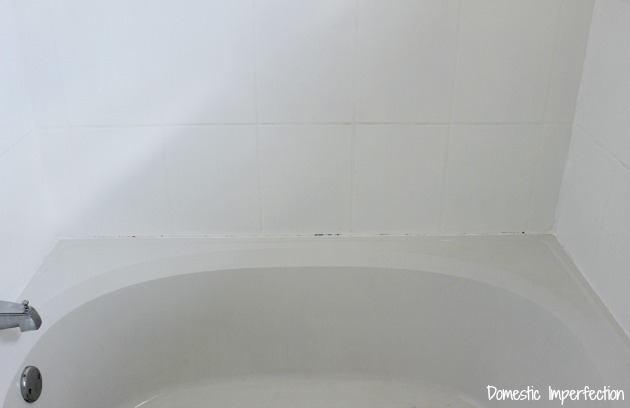 My tub was gross–pitted and stained and looked filthy, even if I’d just scrubbed it. Painting it was easy (prep took more time and effort), but anyone who considers this should know that it STINKS with a chemical smell. For weeks, it stank (and this was during the summer when the window was open 24/7). I let my tub sit unused for four whole days for the paint to set. (I actually did it right before I went out of town.) I couldn’t be happier with how my tub looks (brand new is how it looks now!). I read your post about redoing your bathtub. I have used this product on two bathtubs in the past and it was a nightmare. I used a special Purdy brush that was suggested in the brochure. I had one heck of a time with both tubs. I was just wondering if you used a foam roller? I am looking at redoing one of the in the next couple of weeks and was looking for something a little easier. Thank you for any suggestions you might have. I used just a disposable foam brush that I could toss when finished. Donna – I don’t suppose, given that you were 10 at the time, what type of paint was used in your g’ma’s bathroom? The tile in my bathroom was installed in 1952 and is a color not found in nature or anywhere else. I painted the tile and the tub at our first house. The tile held up really well, but the tub chipped in a few spots. I agree with you it’s not a permanent fix, but it’s definitely a good “get you through” option until you can do a more involved upgrade. My only tip is if you have old caulking, make sure to scrape it off and then scrub it off before you paint. 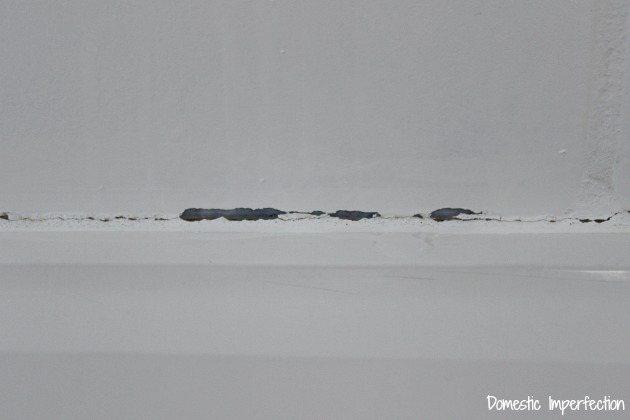 Any old silicone residue will cause your paint to not stick. that’s wonderful! I came across your page because i’m about to take this kinda thing on and wasn’t sure how to do it. Baby will be here in Feb and I HATE my guest bath. 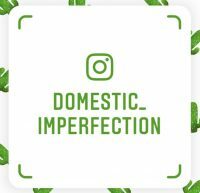 This looks relatively easy and i’m looking forward to getting rid of the outdated hunter green and white checked tile. Yep. We bought it like that. eww. Suggest you don’t do it while you are pregnant. The odor is really toxic! I’m trying to gauge how many boxes we’ll need for the tile surround, floor, and a small tile accent wall. You were able to use just one box for your tile surround, Ashley? Did you have any leftover or you used the entire batch? So far, I’m thinking we’ll buy three or maybe even four! Thank you so much for this post. We bought a house 11 years ago that was built in 1950 with five bathrooms. This week we started remodeling the master bath. There was tile surrounding the tub, on the other walls and on the floor. I wanted it all gone as the tile was a mixture of dark blue, light blue, pink and yellow. UGLY, Ugly, Ugly. This is a 9′ X 7′ room. Probably pretty for the day but not now. This project has turned into a nightmare. A thick wire was nailed to the studs, then a layer of concrete was floated onto the wire, then another layer of concrete was floated onto that, then the tile was inbedded in the concrete. There is 2 and 1/2 inches of concrete and tile that is being removed. I worked on the walls all day Friday. I had two guys working on it Saturday. Currently have two guys with large hammer jacks working trying to remove the tile now. They have been here since Monday and hope to be finished by Friday. The bathroom is upstairs. They are filling buckets with tile and concrete and hauling the stuff downstairs to the outside. Last count they had carried out 66 buckets of tile and concrete. My house is a mess. I had resigned myself that the other bathrooms would remain untouched forever. I will not go through this again. I dislike the tile but not that much. I will try your process on the tile in the other bathrooms. My question is, Does the paint come in colors? I wondered the same thing about painting a floor and e-mailed Rustoleum to ask…they said no, don’t do it. That being said, if you’re planning to replace it in a few years anyway and just need a quick fix for now it might be worth a shot. I am so intrigued by the prospect of painting ceramic tile. Having just had all of our downstairs floors replaced,, we’re moving upstairs to attack 1967, which has been lurking in the upstairs bathroom.Tile floor, tile counter, all in a hidious depressing pattern of burnt orange and chocolate brown.. We shot our wad with the downstairs reno, so I’m trying to find workable solutions that won’t involve buying slate tiles or the corian countertop and spending thousands of dollars to demo and retile this room. The tile is in good shape; just hideous. The kink in the process might be the floor, and whether or not it should be painted (it’s ceramic tile). Here’s the deal – if Rustoleum doesn’t recommend it, is it because it won’t withstand industrial strength wear? This is a guest bathroom that is very rarely used. I’d be delighted if the paint on the floor lasted two years. By that time we’d have the funds to tackle ripping all the tile out and starting new. I would love to be able to get rid of that heinous tile color until we can afford to do a full-on reno of the room. Karen, in your situation I think painting the floor tile would be a great solution. I don’t think its a wise long term solution, but I don’t think you would have any problem if you are only looking to get two years out of it. KarenN, we just refinished all of our ugly stamped cement flooring with a product called spread stone by daichcoatings. They have different coatings for use over any surface, including tile. It’s quite affordable & easy to do, too. 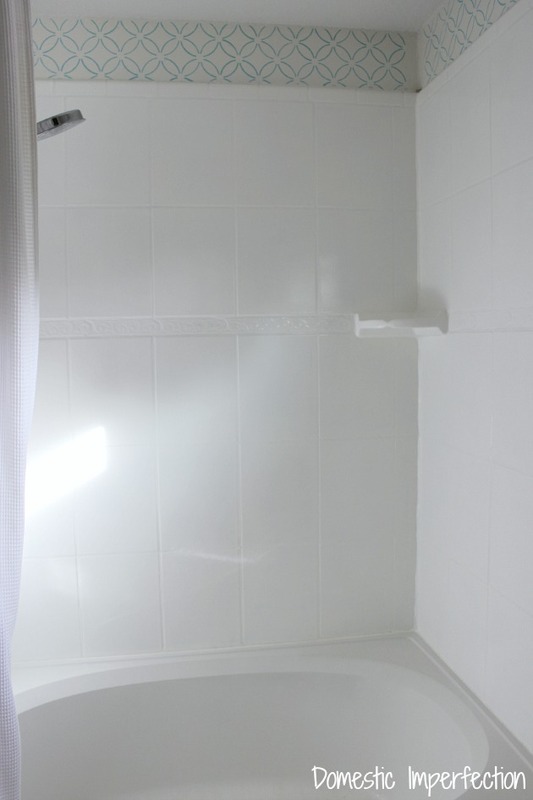 Do you think the floor in a shower would hold up as good as the walls or do you think the excessive contact with water will cause it to chip? You don’t need to go to the expense of an epoxy paint for the floors. Porch paint or acrylic with a polyurethane topcoat will work just fine. Love this idea….and fully plan to give it a shot. Do you happen to know if there any way to tint or add color to this to make it more gray? I don’t know of a way to do that, but theres GOT to be one, right? I would try e-mailing Rustoleum to ask. Every time I’ve contacted them they’ve been quick to respond. I am curious as to what cleaning products you can use on the painted tiles. I live in a townhouse and my bathrooms are the shower tub units. Do you think I could paint this I guess it is fiberglass. Your tub looks really cute! My former landlord had painted a tub in the house we used to rent. Maybe he did it wrong–but it was terrible. After a couple of months, it started chipping. Every time someone used the tub, the little chips grew and soon the whole bottom of the tub was an ugly, blue-and-white blotchy mess. The sides held us well, though. I wouldn’t recommend it, or at least make sure to follow directions very carefully. I don’t think your landlord cleaned it well first. I painted my bathroom walls and sink that were tiled pink, with this product and it has held up perfectly for three years now. Prep is the key. Also I would never scrub with a bristle brush. Reading about your project could not come at a better time! I have recently bought a house built in the 60’s, and while it isn’t too bad, I just couldn’t figure out a cheaper/faster/easier way to update the pink-tiled master bath. I’m saving this page and gonna be following your instructions to a T! What a transformation! And it’s held up beautifully. I’m planning to try this and have a question about your caulk fix. Did you remove the grout or just clean up any flakes, etc. and caulk right over the grout? I am looking to initiate this process here in the next couple of weeks and I am TERRIFIED! Not to mention I really really don’t want it a stark white… can the mixture be tinted at all? Our grout is so nasty and discolored, I do believe it is stained. Any idea on how the paint would do over nasty, gross grout? So excited to try this, but a little hesitant (although it probably wouldn’t look worse than what I have now….). You would have to clean it really well first (like I did) but it would work. Do you want to paint the tiles too, or just the grout? Because if you want to do just the grout then the stuff I used in the post (http://www.domesticimperfection.com/2013/11/how-to-make-dirty-grout-look-new/) works amazing and is a million times easier to use. I plan to paint it all, the grout looks the worst, but the tile is bad too :-( 42 years of a previous homeowner not maintaing appropriate salt in the water softener and basically not cleaning it well have made it gross. Thanks so much for your input!! Not sure how it holds up in a shower, but I love Grout Renew! Comes in various tints, too! I’m so inspired and wish it wasn’t midnight so I could run out for supplies and start my 1990 bathroom. Sure wish I knew what I was thinking when we remodeled and three bathroom have hunter green tile in them. This particular bath has hunter, plum, and a burgundy tile as accents. Do you know if you’d have to paint all one color or do you think you could tape off and create an accent? I’d love mostly white with a touch of grey. I also have 12″x12″ floor tile I would like to paint. Would you think it would be okay if this bath is rarely used? Basically, if visitors need to use the bathroom this is the one they use. The shower/tub is used about every few years! Is the cleaning upkeep hard? I just asked a question you wrote in the blog about. I read the entire thing. I think you did a great job. I am glad you posted this. Thanks so much. I am going to be brave and do it. Its been over 2 years since you painted your shower…how is it holding up? It’s still holding up great, no chips or peeling…though it has lost a little bit of its shine. Did you paint the grout as well? The color looks so uniform on the walls. Yes, I painted everything. The painted grout is SO easy to clean. I am about to do a makeover on my own shower and tub. My only question would be, do you think that there is enough product in a 1qt box to do both the walls and the tub, or is it a project that definitely requires 2? I believe I used one and a half boxes on just the shower walls, so you might even need three. I an about to do a cheap as possible make over to my falling apart bathroom, Ashley yours looked great. How long before you used your shower after you finished painting it? 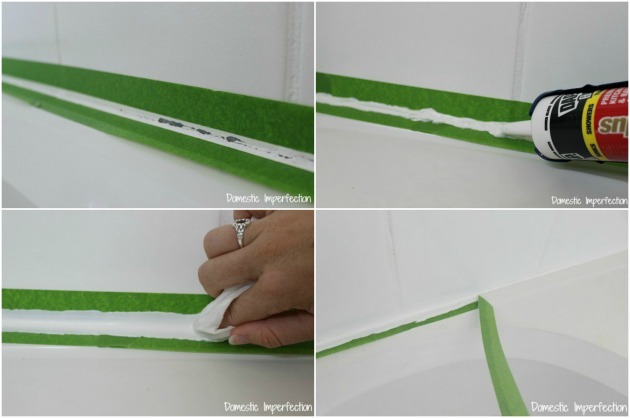 Great idea to use the tape on both side and baby wipes – makes a nice clean line. ‘Preciate the tip. Love this post, thank you so much for all the info. Did you wait 4 hours or 4 days…sorry I am new to DIY projects. Also, curious if anyone was able to find out if the paint comes in any colors other than white? Awesome story! 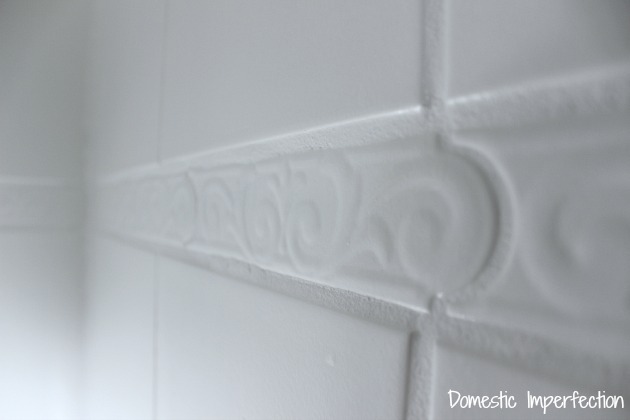 I have often wondered about the long term effects on painted tile, and this article addressed that. Holy Crap!!!! Im sooooooooo doing this!!!!! I love your tutorial! We just bought an old home and the tile is ghastly. My husband has this idea (because he watches too much DIY network) that he’s just going to tear everything down and redo everything. He gets an “A” for enthusiasm but there’s no way that 1) we are going to be able to afford all his big plans 2) there’s no guarantee that I won’t strangle him for procrastinating. I just want the ugly tile gone NOW. You’ve totally given me hope and the confidence that I can tackle this job ASAP. Thank you so much for all the tips, I really appreciate the help. We have a bathroom with cobalt blue tile all over the walls and tub surround. We don’t use that bathroom often enough to justify spending the money to retile, but painting might be the perfect solution! Thanks for the update. It was really helpful to see that it holds up great after a year of constant use! I am so going to do this!! I am only going to be in our house for a few more years before retiring so do not want to spend tons of cash sprucing up to sell, this is perfect solution! My guest bathroom is purple, white and gold….UGLY. So, just to be sure, you roll over all the grout lines? Yup, right over the grout lines just like you are painting a regular wall. Good luck! I love this post and have gathered all the materials needed…I wanted to try using a charcoal colorant on the grout after, and if the colorant doesn’t stain the grout I plan on replacing the grout with a dark gray colored grout. From your experience would the grout stain after it had been painted? Could I scrap the top of the grout to get the paint off and then stain? Or do you think I should totally replace the grout and would it work better to remove the old grout before or after I paint? Thanks for your tips! I don’t think the grout would stain after you painted it, the epoxy paint is thick and from my experience very stain proof. And scraping to off to add grout scares me, because that would break seal on the paint and may cause it to chip or flake. I really think the best solution here would be to not paint it at all and re-tile and grout the whole thing. If you are set in painting it though I would remove the grout, paint the tile, then add the new grout back in. Ok, so you sealed it afterward or not? Wow, awesome job! I had no idea this could even be done! I wish I had known about this before I went ahead and renovated my shower/bath tub! Still, great thing to know for the future. Thanks so much for sharing, this is really awesome, and will definitely save someone a lot of money! We have a shower that is probably plastic or fiberglass..
Do you know if the paint you used comes in any other colors other than white? Just almond (off white) I think. Hi Ashley, I painted the tiles in my rented apartment a few years ago. They were originally pink from the 70s and when some fell off and white replacements were used (the orginal pink tiles were no longer available) I repainted all of them white. About 10 years later the paint is now flaking badly in some of the areas around the shower that get wet. I want to rub them down and do another coat over the top, have you tried that yet? The product I’m going to use says it needs to be left to dry for 5 days without using the shower, but the maximum I will be able to leave it without my flatmates needing the shower is 3 days, and I’m worried it isn’t long enough. Do you, or anybody else, have any experience/tips about this? Thanks. What is the prep work that needs to be done in order to do this? I think I want to do this to my bathroom tiles, tub and floor. They are a horrible yellow color. Also whoever tried rechaulking the tub did a terrible job and it always look dirty no matter how much I clean it. Do you suggest trying to scrape that all off first? How did you prep the tile? Thanks!! The tile in my shower and the tile that surrounds the bathtub were painted a tan/pink color. I have no idea what kind of paint it is. I’m assuming it’s an epoxy paint because for the most part it has held up really well for many many years. Do you think that I could put paint on top of the paint that is already there? I came across this because I want to pain the tile in my kitchen. It’s a small kitchen, so not a lot of area to paint, but am wondering if it will still work as well. The tile of course is mainly around the kitchen sink and behind the range. It’s good quality tile but old fashioned dark green with these awful orange narcissus flowers on random tiles. Hi, I’m just beginning to paint my shower after watching your tutorial. I’m on the first coat and the walls look great but the floor…ehhhh, I’m hoping it will look better after the second coat…..I’ll let you know. Thanks for the tutorial it’s very helpful. What is the name of the paint that you used in your tail project? What about tiny tiles? Would I have to remove all the grout? That would take forever! Does the tub/tile paint come in different colors? I’d like to paint the tile in our second bath, because pulling down tiles in a mid-century is almost futile – they set that stuff into concrete! But a masculine gray bath would be absolutely fantastic. Thanks for the great tutorial, too. We are thinking of painting our outdated bathroom. How is it holding up now? I see this post was from 2014? We sold the house in 2016, but at the time it looked the same as the one year update post. I’m so impressed with your project! We are considering selling our house and the upstairs bathroom has a horrible blue tub and tiles. The one thing the realtor said was “do something with that!” Not having much money, I’ve been searching for a solution and this came right on time. Thanks for doing the work first (hahaha) and the feedback on how it went. You did a great job. Now, let’s see if I can! Hello. 2 questions. 1. Does this paint waterproof the shower room walls? 2. What do you use to clean the shower? I was thinking anything abrasive would be bad for the finish. Thanks, Richard. Yes, I painted right over the grout, the epoxy seals it and makes it super easy to clean. I didn’t caulk the grout, I just caulked around the corners (like where the tile meets the tub) after it was finished drying. I really need to update my bathroom and cannot afford the $25,000.00 quoted for such a tiny bathroom. I want to try this, but have limited dyi experience. I wanted to know if your bathroom is still holding up? I just love your work skill also whole work process. I also think it’s a great way to cover up outdated tile that is driving you crazy. And after something adding it will be consider for permanent solution. I am really impress on it and i am going to apply it on my home . Thanks for the sharing your brilliant work skill with us. Hope so you will continue it in future. I would like to know how you clean the paint? I have painted counter tops and it’s difficult to clean. My husband refuses to let me replace an old acrylic shower pan and it looks horrible. I want to do something myself. Can I tile over it? I wanted to use the new pebble style sheets. Sounds logical to me. What do you think? Wow, nice projects!! I am also painting my shower. Thanks for sharing your post. I like it. Great to hear that things have held up, it has definitely crossed my mind as I read the posts on painting tile, and you answered my question! Thanks! How did you deal with the after paint smell with a baby in the house? We moved into the guest room for a few nights and sealed off the master bedroom and bathroom, using a box fan and an open window to let it air out. I like the caulking tip! Thanks! Heys great 1 year follow up. Read many articles was mixed. Now will do it.